ZHOB: International Pashtoon Culture Day celebrated here in Zhob and other Pashtoon dominated districts of Balochistan province. Nationalist parties, literary and culture organizations and social activists arranged musical programs and cultural shows to mark the day and highlight the centuries old Pashtoons’ history and their rich culture. Children were wearing brightly colored and embroidered dresses. The youngsters clad in traditional dresses and wearing turbans performed traditional dance ‘Attan’ to the tune of Pashto folk songs and drumbeat in every nook and corner of the province including provincial capital. Functions were also held in Loralai, Pishin, Ziarat, Chaman, Musakhail, Harnai, Killa Saifullah, Muslim Bagh, Duki, Khanozai and other parts of the province. University of Balochistan Pashto department held a seminar to mark the day. 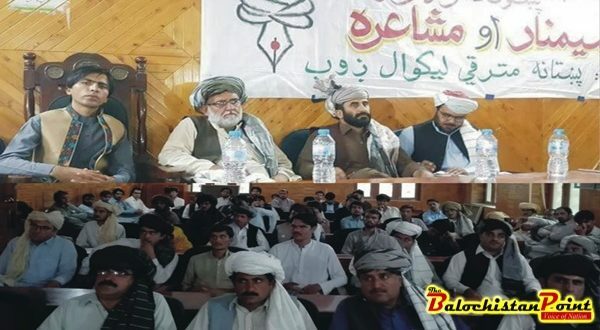 President Pashtana Mutaraqee Leekwal (Progressive writers) Muhammad Sharif Sherani, who presided over a function at district assembly hall says, celebrating the day is aimed at highlight the rich culture and to show unity, solidarity and promote peace, brotherhood and tolerance in the society. “Pashtoons having rich history and culture, are hospitable, peace-loving people and believe in non-violence,” adding those who forget their culture and history are vanished. In order to keep our culture alive, we must hold cultural events regularly to link the new generation with the history and culture. He emphasizes. It is to be mentioned that the Ex-minister Abdul Rahim Ziaratwal had announced to observe Pashtoon Culture Day on September 23rd every year. He made this announcement soon after the decision made in the International Pashto Literary Conference held in Quetta in Sep 2015. The day has now become an annual feature since it was first celebrated two years back.